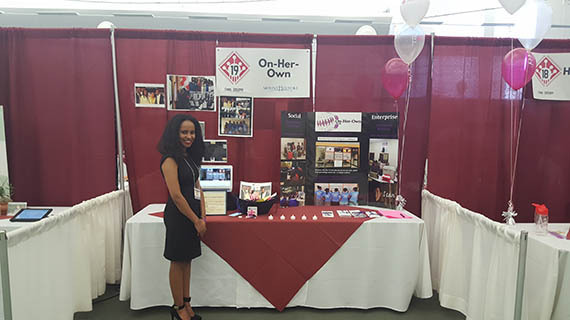 Photo Caption: Mount Holyoke College student Woyneab Habte ‘17 won second place in the Draper competition for her entry “On Her Own,” an organization that provides economic opportunities for female Ethiopian college students. For the past several years, Barbara Hou has gained valuable insights into entrepreneurship, and she shares them (along with other founders) in her soon-to-be-published book Startups Demystified: Founders Share Strategies, Secrets, and Lessons Learned. In addition to being a doctoral candidate at Harvard University, Hou continues her research into the dynamics of startups and teaches entrepreneurship courses. Previously, she was executive co-director of Harvard Innovation and Ventures in Education. Recent articles What is “Generation F?” and Tracing the Causes and Consequences of Generation F by Barbara Hou and Jocelyn Mosman piqued my interest because I too have noticed an increased interest in entrepreneurship among female college students and college-bound high school girls. To learn more, I scheduled a phone conversation with Barbara Hou. In today’s blog post, I’m sharing our conversation via a series of questions and answers. 1. What experience do you have as an entrepreneur and how has this experience affected your current research on startups? “When I was 28, I founded an educational startup that was trying to establish a global leadership university for women from Asia and the Middle East. We raised more than US$6 million dollars and identified 100 acres of land for the campus site. Although we ultimately couldn’t secure the university license from the Malaysian Ministry of Education, the whole experience was transformative. I learned about what it takes to found and lead an organization. In that process, I became curious about how other young founders were learning about how to start a startup and what were the most effective strategies they were using to navigate their startups. It turned out that most young founders that we interviewed were not reading books to glean wisdom but were talking to others and getting piecemeal bits of advice from a collection of individuals. They also weren’t using unique strategies but were applying a predictable set of processes and mindsets to address the challenges that their startups were facing, strategies that the existing startup literature seems to take for granted. 2. Why do you think there is a rise in entrepreneurship among college or graduate students and young professionals? Second, our definition of what is a “startup” has expanded. We no longer consider those starting only for-profit companies to be the only legitimate startup folks. More social entrepreneurs and social activists consider themselves part of the “startup world” whereas in the past I think that that term was limited to the for-profit and tech sectors. Third, undoubtedly, the explosion of smartphones and tablets and other mobile platforms has created more opportunities to create. Lots of young people have ideas for apps, and they aren’t just sitting around daydreaming about them. They are out creating them. And they don’t need an office to do so - just a laptop and Wi-Fi connection. 3. What advice do you have for “Gen F” individuals who are thinking about starting a company? 4. At the undergraduate level, what are colleges and universities doing to position traditional and non-traditional students for success as entrepreneurs? “Universities are playing a large part in the uptick of entrepreneurship of young people. In our research, we are finding that they are offering more classes, extra-curricular programming, and campus-wide events to support students’ entrepreneurial efforts. You can take a class on how to write a business plan or how to think innovatively or how to proceed with design thinking. There’s a whole ecosystem related to startups on campuses these days, from pitch competitions, incubator programs, and campus talks about startups to seed funding opportunities, and so on. For example, in 2013, Smith College, my alma mater, established the Draper Undergraduate College Women Entrepreneur’s Competition. Smith also fosters entrepreneurship in other activities and programs, including E*Teas, an elevator pitch contest, house competitions, a “Start Up Weekend,” a program for University Innovation Fellows, and lots of workshops and mentoring. At Harvard, the Innovation Lab was created in 2011. These are all pretty recent developments. Other women’s colleges also are engaging students interested in entrepreneurship. For example, Mount Holyoke College, Jocelyn Mosman’s soon-to-be alma mater, supports and encourages entrepreneurship. The college has an Entrepreneurship Club, Entrepreneurship Programming initiative, Pitch5 Competition, Student Ventures, and, starting in the 2016 fall semester, a new interdisciplinary minor: Organizations, Entrepreneurship, and Society. Part of Mount Holyoke College’s strategy is to have actual entrepreneurship practitioners such as Dr. Tamara Stenn, develop their programing. Stenn is an economist and also the owner of social enterprise, KUSIKUY, a Fair Trade knitting company (www.kusikuy.com). “Entrepreneurship enables students to build on insights gained in the classroom to drive real social change and realize their own passion,” explained Stenn. In the 9 months Stenn has been on campus the number of student enterprises rose from 3 to 26 with over $12,000 secured in funding and grants from programs such as Clinton Global Initiative University (CGI U), Draper Competition, Valley Venture Mentors, and Mount Holyoke College Pitch5. My conversation with Barbara highlights how exciting it is for my generation to watch millennials come up with innovative ideas and new ways of doing things. No longer constrained by traditional employment, entrepreneurship provides this forward-thinking generation with a realistic career option.